﻿ Best Price on Finca Cantarana in Montana Grande + Reviews! 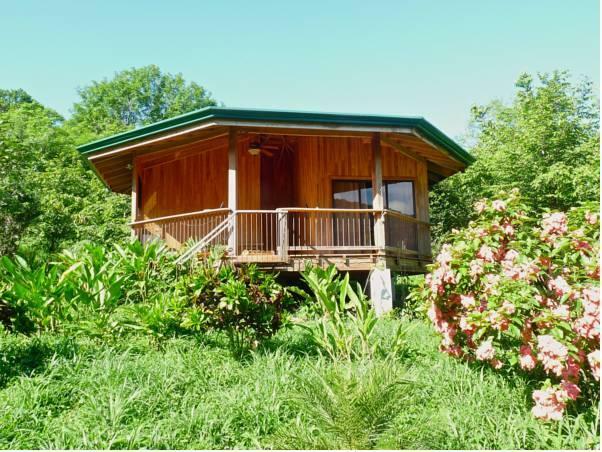 Located in Montaña Grande, 7.5 mi from Playa Naranjo Town Ferry, Finca Cantarana offers gardens and terraces to enjoy the nature that surrounds the property. It also has private parking available on site. The cottage features 2 bedrooms and is made of wood. It has a double bed and a sofa bed available. The private bathroom offers free toiletries. The amenities include a working desk, fan, and seating area. While Finca Cantarana offers complimentary breakfast to its guests only in some rooms, they will be able to find other food options 1.2 mi away, in Lepanto. Jicaral Town is 15 minutes’ drive away, and Playa Naranjo is is where ferry arriving and departing to and from Puntarenas. Please note that the 50% of the reservation must be paid in advance. Once a booking has been made, Finca Cantarana will contact the guest directly to arrange payment by bank transfer. Please note that during rainy season guests should rent a 4x4 van due to the streets conditions. It is recommendable to rent a 4x4 vehicle to come into our area. The paths are often chaotic. Please inform Finca Cantarana of your expected arrival time in advance. You can use the Special Requests box when booking, or contact the property directly using the contact details in your confirmation. Payment before arrival by bank transfer is required. The property will contact you after you book to provide instructions.